Rohit Sharma scored his seventh score of 150 in ODIs, the most by any batsman in List A cricket. Thanks to centuries from Rohit Sharma and Ambati Rayudu, Indian team managed to score 377-5 in their 50 overs in the fourth ODI at the Brabourne Stadium in Mumbai. After choosing to bat first, India got off to a great start with the openers Shikhar Dhawan and Rohit taking on the bowlers from the word go. Yet again, Dhawan failed to convert his start but Rohit ensured that the wickets of Dhawan and skipper Virat Kohli did not hurt the team as he shared a 211-run stand for the third wicket off just 26 overs and put India in command. 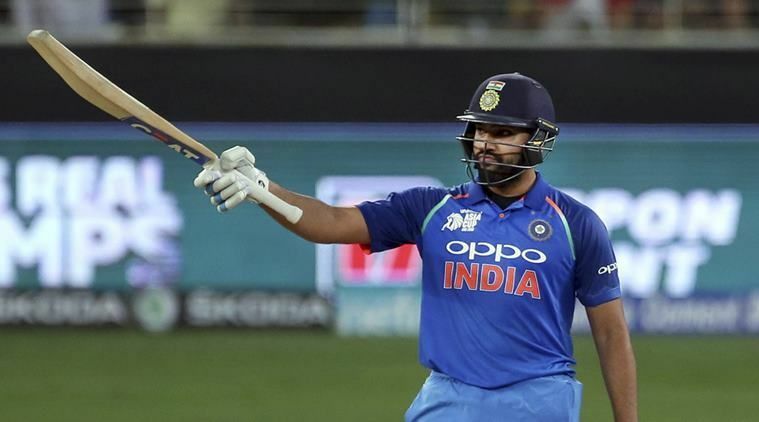 Rohit scored his 21st ODI century and looked good for his fourth double ton in the format before he was dismissed for 162 off 137 balls with the help of 20 fours and four sixes. Rayudu sealed the number 4 spot in the side by scoring his third ODI century before getting out for 100 off just 80 balls with eight fours and four sixes. Let us take a look at some of the interesting numbers from the first innings of the game. 1 – Virat Kohli has scored 420 runs in the ongoing series, which is the most by any batsman against West Indies. 2 – Rohit’s century is the first ODI century at the Brabourne Stadium. 3 – Rohit Sharma scored his seventh score of 150 in ODIs, the most by any batsman in List A cricket. Earlier in the series, he broke the record for the most 150+ scores in ODIs. 4 – Shikhar Dhawan and Rohit Sharma went past Sachin Tendulkar-Virender Sehwag’s tally of 3919 runs for the opening wicket. Only Sachin and Sourav Ganguly (6609 runs) have scored more than Rohit and Dhawan as Indian openers. 5 – Rohit Sharma’s four sixes today took his tally to 198 ODI sixes and in the process, he overtook Sachin Tendulkar’s tally of 195 sixes in the format. MS Dhoni is the only Indian batsman to have hit more ODI sixes than Rohit. 6 – Rohit Sharma scored his 19th ODI century as an opener, which is the second-most by an Indian. Only Sachin Tendulkar has scored more than Rohit (45) as an opener in ODIs. 7 – Rohit Sharma is only the second player after Hamilton Masakadza (against Kenya in 2009) to hit two 150+ scores in a series. 8 – Rohit Sharma’s 162 is the second highest score by an Indian batsman against West Indies in ODIs. 9 – Rohit Sharma scored his 21st ODI century in his 186th innings, the fourth fastest to that mark after Hashim Amla, Virat Kohli and AB de Villiers. 10 – This is the fifth time Rohit Sharma has scored over 300 runs in a bilateral ODI series. Only Virat Kohli (7) has scored 300 runs on more occasions than Kohli. 11 – India registered their 13th total of 375 or above in ODIs, the most by any team. 12 – Virat Kohli’s score in the fourth ODI, his lowest score in ODIs in 2018.